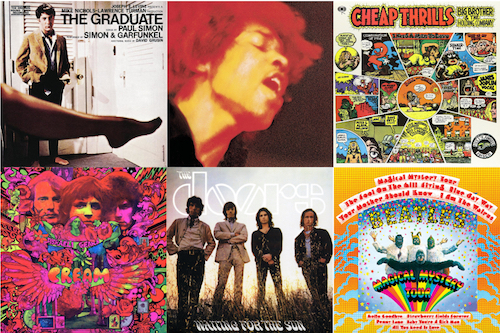 Looking back at mid-July 1967, the Summer of Love was in full swing. But all was not “peace and love”; race riots were taking place in Newark, NJ, ultimately leaving 26 dead. Shortly thereafter, Minneapolis also had riots, with fatalities. 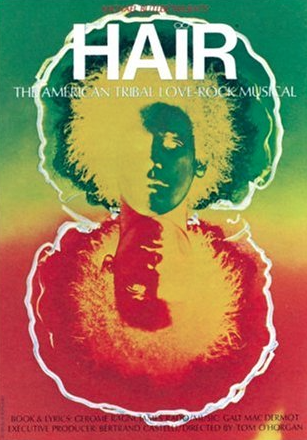 And Top 40 radio mirrored the spirit of the people with music that spoke to the times. 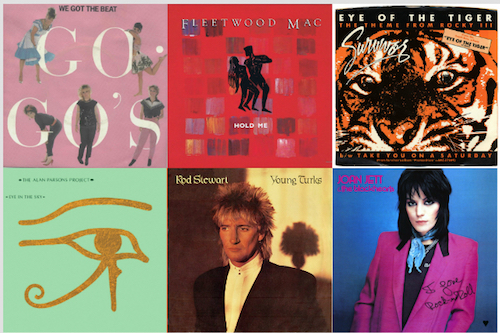 This week’s chart, from Chicago powerhouse WLS, features a great playlist of songs that continue to resonate with listeners. Bubbling under the Top 10, and debuting at #29 (on its way to #5 in the U.S.), was Procol Harum‘s “Whiter Shade of People.” The song remains one of the most classic rock tunes of all time. Read our full recap of the song’s development and lasting impact here. The Doors “Light My Fire” jumped from #24 to #21. The song would ultimately reach #1, where it would stay for three weeks. At #20, The Monkees were enjoying success with a two-sided single, “Words” b/w “Pleasant Valley Sunday.” The latter would ultimately out-do the former, peaking at #3. 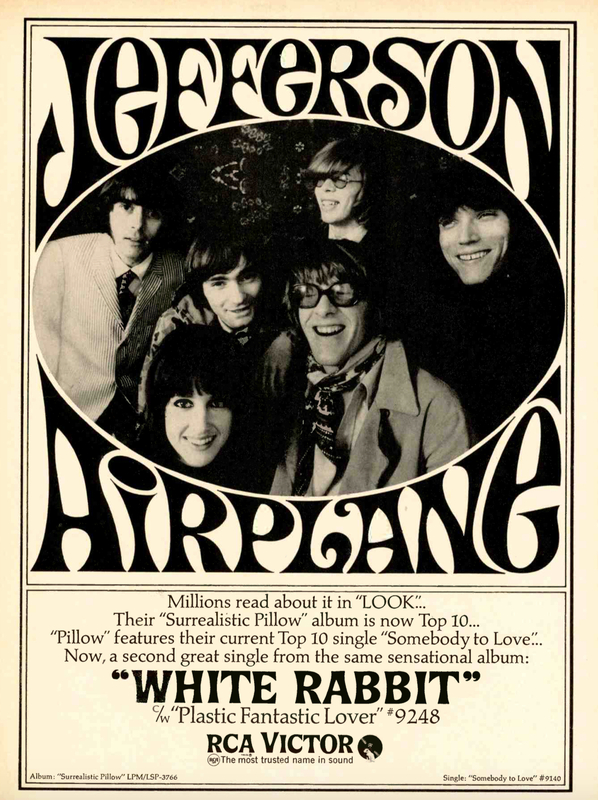 Jefferson Airplane were riding high with “White Rabbit,” which jumped to #9 (from #13) this week. Related: What were the top hits of 1967? Chicago’s The Buckinghams earned five Top 15 hits in less than two years and then none more before they disbanded in 1970. One of them was “Mercy, Mercy, Mercy,” written by jazz great Joe Zawinul. 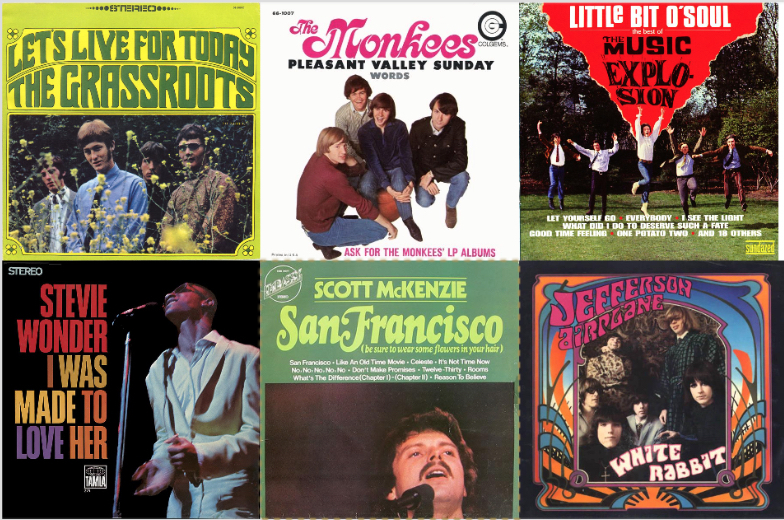 Even more prolific were the SoCal-based Grass Roots who had no less than 10 Top 30 U.S. hits from 1966 – 1971. 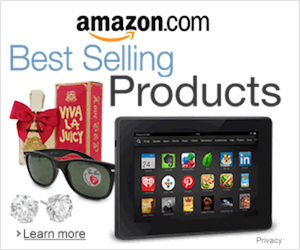 “Let’s Live For Today,” at #6 this week on WLS, sold two million copies. Watch none other than Jimmy Durante introduce their performance! No other song embodies the spirit of the Summer of Love than Scott McKenzie‘s “San Francisco (Wear Flowers in Your Hair),” at #5 this week and written by none other than the Mamas and the Papas’ John Phillips. Read our recap of the song’s legacy here. A far more successful vocal pop group, The Association, were at #3 with “Windy” this week, their second career #1 smash. As we’ve written before, the California-based group’s singles were either huge hits or misses: they enjoyed five Top 10 songs. Although their name sounds like the title of a K-Tel album, Music Explosion was actually a garage rock band. Their memorable (and only) hit, “Little Bit O’ Soul”–at #2 this week–begins with the lyrics: Now when you’re feelin’ low and the fish won’t bite. And at #1? The Four Seasons’ extraordinary lead singer, Frankie Valli, stepped out for the occasional solo release, one of which was “Can’t Take My Eyes Off You,” which became a #2 U.S. pop hit. The song was used brilliantly in one of the bar scenes in The Deer Hunter as a young De Niro, Walken and Savage prepared to head to Vietnam. 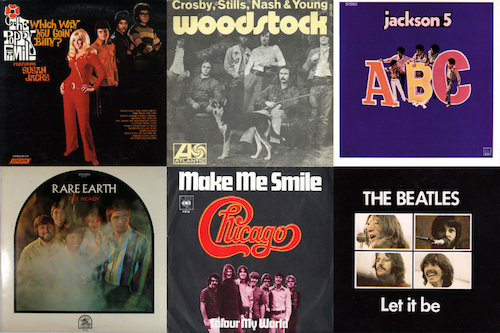 Other great songs on the radio in JULY 1967 include: “A THOUSAND SHADOWS” (The Seeds), “BLUE’S THEME” (Davie Allan And The Arrows), “C’MON MARIANNE” (The Four Seasons), “DESIREE” (The Left Banke), “FAKIN’ IT” (Simon And Garfunkel), “GROOVIN'” (The Young Rascals), “HAVE YOU SEEN HER FACE” (The Byrds), “HEROES AND VILLAINS” (The Beach Boys), “JACKSON” (Nancy Sinatra And Lee Hazelwood), “MIRAGE” Tommy James And The Shondells), “OMAHA” (Moby Grape), “ONE BY ONE” (The Blues Magoos), “OUT AND ABOUT” (Boyce And Hart), “PURPLE HAZE” (The Jimi Hendrix Experience), “REFLECTIONS” (Diana Ross And The Supremes), “RUN RUN RUN” (The Third Rail), “SHE’D RATHER BE WITH ME” (The Turtles), “SOCIETY’S CHILD” (Janis Ian), “SOMEBODY TO LOVE” (Jefferson Airplane), “SOUL FINGER” (The Bar-Kays), “SUNDAY WILL NEVER BE THE SAME” (Spanky And Our Gang), “THE EAGLE NEVER HUNTS THE FLY” (The Music Machine), “THE RIVER IS WIDE” (The Forum), “UP UP AND AWAY” (The Fifth Dimension), and “YOU KEEP ME HANGIN’ ON” (Vanilla Fudge)!